On Friday night next, September 2nd at 8:15 pm in Parnell Park, our senior team will play in the Dublin Ladies Senior Championship final for the fourth time in five years. This year's final is a repeat of last year when we played St. Brigidâs. Members will no doubt be aware that our ladies managed to hang on to win in a very tough encounter and thereâs no doubt that St. Brigidâs will be looking for revenge following last yearâs defeat. 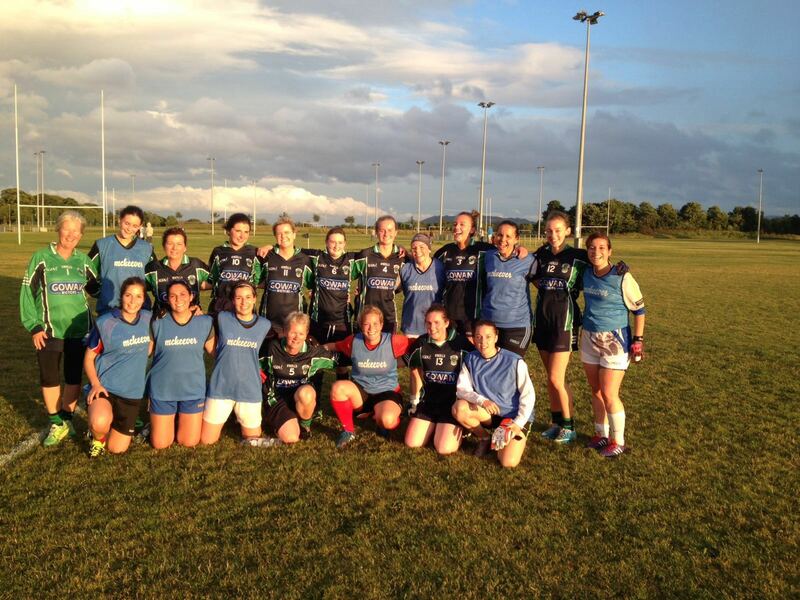 Best of luck to team captain Sarah Brophy, the rest of the panel and the management on Friday night. Looking forward to seeing all club members in Parnell Park on Friday night. The buses to the Dublin Ladies Senior Championship final have been booked and all are almost full. Thanks to Paul Ryan and Colette OâKeefe for organising. Any last minute requests should be sent to Paul or Colette and every effort will be made to find you a seat, but please do get in contact ASAP to avoid disappointment. We are looking for a volunteer to help out with the âFacilities co-ordinatorâ role. Anybody interested in helping in this non-executive position should send a mail to chairman@foxcabgaa.ie. Members will remember that we recently won â¬1000 from LIDL. The official cheque presentation is happening this Wednesday night in Kilbogget at 7 pm and members are welcome to come along. Our second CÃºl camp of the summer concluded on Friday afternoon with all recipients receiving their certificates, posters and goody bags from our own Sinead Goldrick as well as Dublin men's senior player, Paul Mannion. Similar to the June camp, the feedback from participants and parents was of the highest order. Well done to Jane O' Connell Bell and her hard working team for another fantastic week. A more detailed report on the activities from both camps is available here. The senior team would like to thank all members who attended the very successful Table Quiz on Thursday night. A great night's entertainment was had by all. Thanks to The Grange Pub for hosting the event and particular thanks to all the helpers from the G4M team on the night. 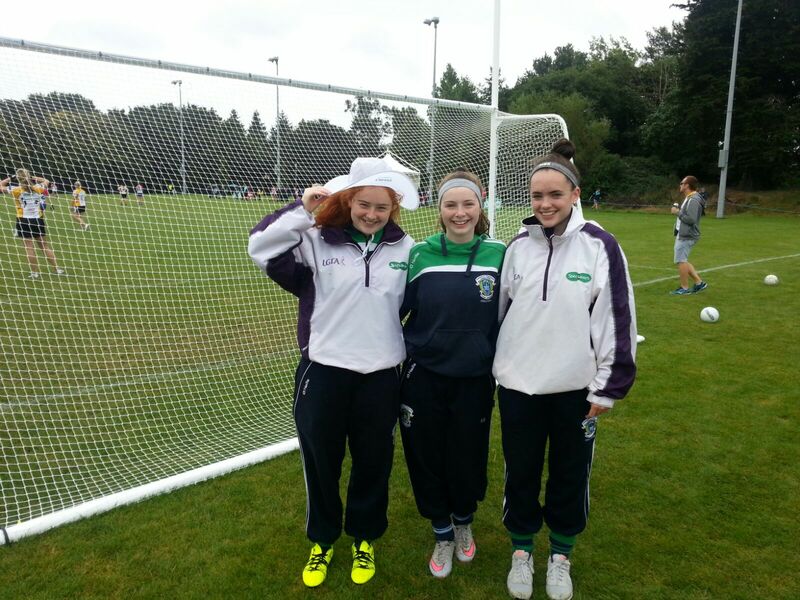 Congrats to Rachel Mahon, Sophie Merrigan and Sarah Currivan who were on the Dublin U17 Development Squad that took part in a national blitz in Naomh Mearnog last Tuesday. Both players had an outstanding tournament. Sophie and Sarah names have been added to our ever increasing county representatives page. Final reminder to all lead mentors that final numbers, and payment, for seats on buses to the County Final on September 2nd should be returned to Paul Ryan or Colette O' Keefe by this Thursday, August 25th. Best of luck to all underage teams who start their championships in the coming week. Fixtures will be sent out on Friday evening. Senior team player Ciara NÃ­ Mhurchadh has almost completed her studies to become a physiotherapist. As part of her intern program, Ciara is currently working in Sports Med Ireland on Kildare Street. During her internship, Ciara is required to treat patients - without pay, so if any members have any niggles or injuries that could benefit from a review by a physiotherapist, or just want a gym program devised, feel free to contact Ciara on 086 2387666 and she'll make arrangements for you to see her in 32 Kildare Street. Running a GAA team is an expensive business, but running a successful GAA team is even more expensive. As members are no doubt aware, our senior team have reached the championship final again this year and to help offset some of the expenses, a fundraising table quiz will be held in The Grange Pub on Thursday, August 18th @ 8:15 pm. The senior players will be there on the night so this is a great opportunity for members to come along and wish the ladies all the best as they strive to retain the championship title. A table of 4 costs 40 euros and a great night's fun is assured! If you are unable to attend on the night but would like to contribute, there is an option to do so via our web site. The senior championship final has been scheduled for Friday, September 2nd at 8:15 pm in Parnell Park and Paul Ryan and Colette O'Keefe have kindly volunteered to organise buses to this game. An email has been sent to all mentors regarding arrangements for buses to the final and parents should start to hear about this in the coming days. All teams have been asked to confirm numbers by August 25th so if you don't hear about this in the coming days, please do ask your team manager about this! 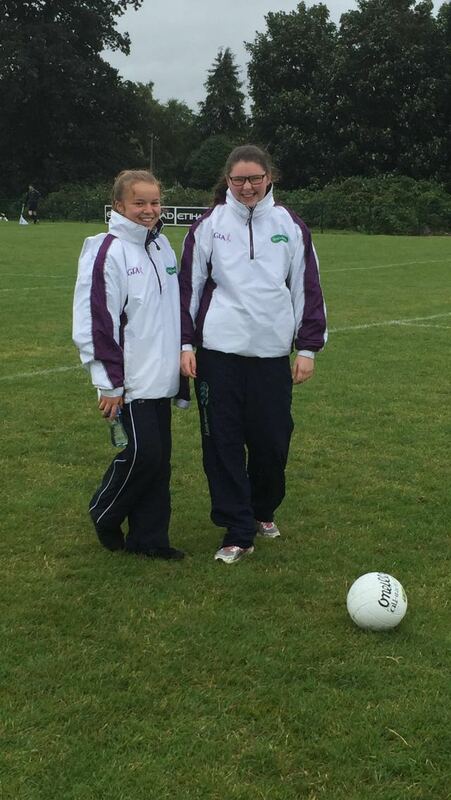 Thanks to all club members who helped out at the recent GAA World Games in UCD. The organising committee were extremely appreciative of the assistance received from the club. Pictured below are some of our members who acted as umpires during the competition. The club has set up a Book Swap in the clubhouse where members are encouraged to come along and bring a book and take a book in exchange. Give it a try, you'll love it! Senior team player Ciara NÃ­ Mhurchadh has almost completed her studies to become a physiotherapist. As part of her intern program, Ciara is currently working in Sports Med Ireland on Kildare Street. During her internship, Ciara is required to treat patients without pay, so if any members have any niggles or injuries that could benefit from a review by a physiotherapist, or just want a gym program devised, feel free to contact Ciara on 086 2387666 and she'll make arrangements for you to see her in 32 Kildare Street. Running a GAA team is an expensive business, but running a successful GAA team is even more expensive. As members are no doubt aware, our senior team has reached the championship final again this year and to help offset some of the costs, a fundraising table quiz will be held in The Grange Pub on Thursday, August 18th @ 8:15 pm. The senior players will be there on the night so this is a great opportunity for members to come along and wish the ladies all the best as they strive to retain the championship title. A table of 4 costs 40 euros and a great night's fun is assured! If you are unable to attend on the night but would like to contribute, there is an option to do so via our web site. Commiserations to Tarah O'Sullivan, Hannah O'Neill and their Dublin teammates who narrowly lost out to Cork in the All-Ireland Final last Monday. Both Tarah and Hannah turned in terrific performances but it just wasn't enough to prevent Cork from retaining their title. After the game, the club hosted a post-match reception for the team, management and parents in Seapoint Rugby Club. Our thanks to Seapoint for the use of their premises. Thanks also to those who helped out on the night. Our August CÃºl Camp is a little over a week away and it's looking like this camp will be even better than the July camp. Jane O'Connell Bell and her team are putting the finishing touches to the camp. Places are almost full so intending participants should book here as soon as possible to avoid disappointment. 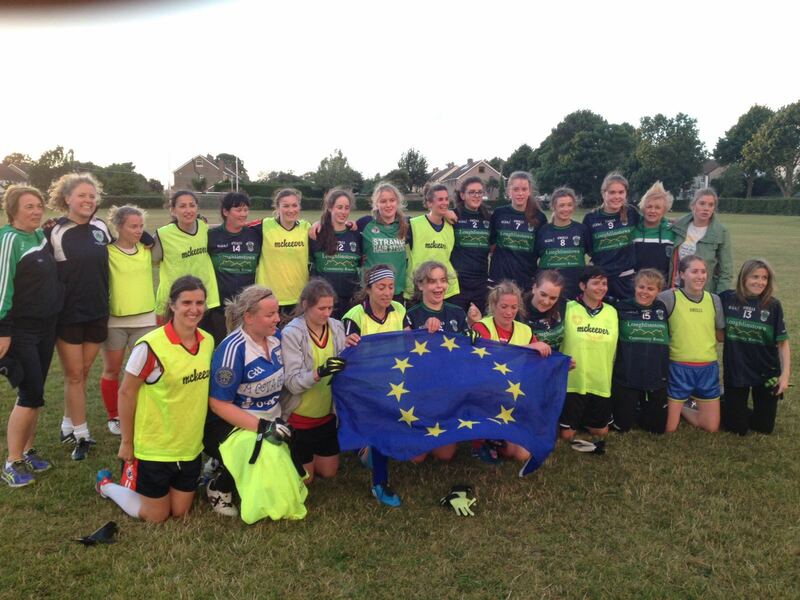 Earlier this evening (Sunday) in Kilbogget, Foxrock Cabinteely took on the Europe Ladies GAA team who will be playing in the GAA World Games later this week. This was the last chance for the Europe team to iron out any kinks before the competition begins. 2 fantastic games of football were played between 4 very determined teams and in the end, the European Ladies came out victorious in both games. We wish them the very best of luck in the week ahead! Best of luck to club members Pat Ring, Glyn Davies, Emma Hughes, Faye O'Connell Bell, Lille O'Rourke, Aobha Russell and Kez Higgins who will be performing lines persons and umpire duty in the GAA World Games this week.